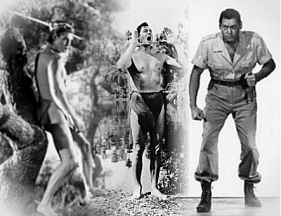 In January 1967, I learned that Johnny Weissmuller would be a guest at the yearly 'Dapper Dan' sports banquet sponsored by The Pittsburgh Post-Gazette. These annual events honored local sports personalities. I called the sports department, asking how I could get an interview with Johnny. They gave me his agent's name and phone number. I called him and set up a time and place. Johnny was going to stay at the downtown Pittsburgh Hilton Hotel, and I was given a time to be there, on Saturday, January 28. I took a tape recorder with me, and here is the transcribed interview. 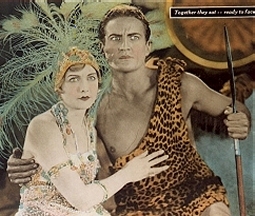 BH: Did you ever meet Edgar Rice Burroughs? JW: Yes, I met him when I made the first Tarzan picture. In fact, he said he liked me best of all for the role. In fact, he said that many times. BH: Were you invited out to Burroughs' home? JW: I went out there one time - when I signed to make the first picture. His son-in-law [Jim Pierce] was there. He also made a test for that same picture but he didn't get it. I got it. Didn't he do a Tarzan one earlier, before sound came in? BH: Yes, he did. Did you ever meet the one right before you, Frank Merrill? JW: No, never did, but I met the first one, Elmo Lincoln. I knew him. I met him a couple of times at different places, sometimes on the beach. BH: Did Burroughs ever come out to the studio? JW: All the time - he loved it! BH: All through the whole series? JW: Yes. During the first picture we made back in 1931, quite often. He liked it when it was done. He was marveling at the way we could do things - work with the animals, and of course I don't think he had ever been to Africa, this was just his imagination, but he never imagined we could get along with animals like that. He just wrote about it, just hoping. BH: You worked with that lion, "Jackie," a lot? BH: Did he get out of it? Did he get too old? JW: Yes, we had him first, then we had his son, but he was tough, you know. Before a picture would start you always go to visit him at the jungle compounds, that's where he lived, and I used to sit around there and play with Jackie and have lunch with him and let him get used to my smell. And I got used to his smell. We got to be buddies, so he wasn't a stranger to me when he came on the set, because he let me play around with him, wrestle with him a little bit. I was allowed to come near him for 20 minutes, then he would stop me and say 'That's all,' give me a little growl, and I would get out of there. But we could play around with each other for a while. BH: Had you heard of the character Tarzan before [you appeared in the films]? JW: Yes, I had. I've known Tarzan since I was a little kid. I read all the books. I never thought I would do Tarzan. BH: No kid does, I imagine. 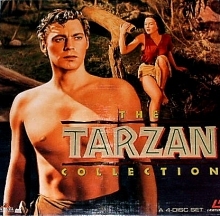 If he did a movie on Tarzan it would probably be the greatest thing that would happen to any kid. 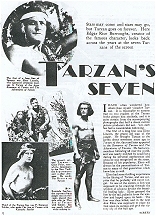 How did you feel about Tarzan after reading the books? JW: Well, I'm glad I read the books in the first place, because it sort of made you give it the far-off look, you know that kind of not understanding look ... that you're kind of dumb about a lot of subjects; you have a funny look in your face. I think it helped me a little bit. As far as that's concerned I just played it straight, the way I am. 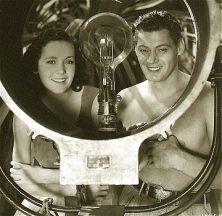 BH: How was Maureen O'Sullivan to work with? I always had the impression she didn't like the role. JW: Well, it was kind of wished upon Maureen, because the part had to be played by an English girl, you know, an English accent, and at that time at Metro, I think she was the only available one there was, around there. But we seemed to get along all right, 'cause I was like a big brother to her. I took care of her, and watched over her a little bit. I knew animals, and I was more of an athlete - I could get up in the trees easier because she was so frightened about so many things that you would put an ordinary girl into. So, we got along well together. BH: Did she get tired of the role and want out? JW: I don't think so. She went almost all of the way there. I had a seven-year contract with Metro, and I think we worked about six years together. Metro kind of let us go on account of the war. The war got on, or something. Plus the foreign market. They thought it wasn't going to be any good. Sol Lesser picked it up and we started from scratch again. We did them again. BH: How about Johnny Sheffield? JW: Johnny was a good little boy. He was a real good athlete when he was a kid. He picked up things real fast and he learned things real fast, which was so nice because he had so much natural ability. Most athletes who have natural ability can do most anything, because you train so that your body responds to what you want ft to do faster than the average person could. BH: Did you ever get hurt? JW: Oh, I had the usual - water on the knees and I broke my nose a couple of times. I had a few broken ribs failing out of the trees, but nothing serious, and fights and things like that. Knocked down. BH: What would you say was the hardest thing in making the films? JW: So many retakes. You know animals, they don't understand. You just keep doing R over until they get R right. That's the hardest thing we do. BH: What is your boy doing? JW: My boy is out in California. He is now working for his grandfather. He has his own theatrical outfit on the side. He'd like to be an actor. BH: He wants to act on the stage? JW: Yes, he would rather act than be in movies. JW: He's a good swimmer. He won a couple of high-school championships out in California, but he never followed it up, he just decided to be an actor. He got smaller than me. BH: Still play any golf? JW: Oh, I play golf when I'm done. I'm down at Fort Lauderdale Hall of Fame, you know. We handle about 500 kids a day. We pick up the good ones and try to make swimmers out of them. So, between swimming and playing golf, I'm a pretty busy guy. BH: What is your fondest memory of making the films? JW: Oh, I don't know. You know, I never made films before in my life. This was my first attempt to be an actor. 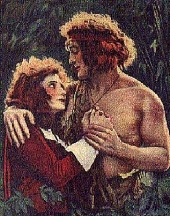 I didn't have much dialogue, just "Me Tarzan, You Jane.' So it was kind of a challenge, whether I could be good enough to be in this business as long as I have. I think the Tarzan role helped me a lot. I got a big thrill out of it. BH: Almost everybody before you wore a leopard skin. For you they changed the costume. Do you know any background as to why they changed it? JW: Gee, I have no idea. I didn't even know that. I didn't even notice the change. I thought he always wore that skin - the deer skin. It's much easier, much lighter. It seems to me to fit better. BH: I've never heard anything either, or why they changed it. Buster Crabbe came right after you. JW: And he wore the leopard skin. BH: He was back to the leopard skin, but from that point on they never went back to leopard skin. In New York Adventure, did you film any of that in New York City? JW: Yes, we did. We took the exteriors of the bridge. BH: Did you actually climb up on the Brooklyn Bridge? JW: Yes, it was easy to climb up there. I didn't do the dive 'cause it's over 300 feet. BH: But you did climb on the Brooklyn Bridge? JW: Oh, yeah, I did that part. BH: They blocked it off? JW: Yes, they had to hold up both sides. It was the idea of getting the OK to do ft from the city. It took time doing it. BH: You worked down at Silver Springs for Finds a Son. JW: Yeah, we did that picture down in Florida, at Ocala and Silver Springs. It was very clear water, so nice. BH: Were you just down there for one picture? JW: Yes, we did almost the whole picture down there. It was very nice because we had a long time. A little vacation. We had a good time. A lot of swimming, which I liked. BH: Other than going down to Mexico, did you go anywhere else for jungles? JW: No, we did most of the scenes there. We went up to the pyramids. Up to where the grotto was. There was a big cave down there, we went into this cave. And in the ocean a good deal. BH: Was most of the jungle in Hollywood? JW: Up in the mountain was the jungle. But we also used Sherwood Forest [in Los Angeles]. BH: There is one thing in your book that interested me. 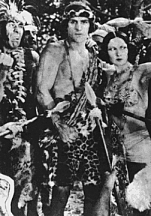 You said you were out in Hollywood with Douglas Fairbanks and Sol Lesser and Fairbanks mentioned you as Tarzan. JW: Yes, way back. I think back in 1929. I was on my way to Honolulu to swim in a championship meet. Sol Lesser was then trying to get Fairbanks to do the Tarzans. But he said, "I don't think I should do it. Too many people know me and know that I've grown up, and know how I speak. You should put a new face on the screen. Someone people don't know." He pointed at me. Everybody laughed at that. I said I didn't know anything about jungles. BH: Where did you film the jungle in Hollywood? JW: We went out to Sherwood Forest. And in Baldwin Park. They had a big lake there. We had a lot of good swimming there. It was just like a jungle. BH: I read somewhere that you are scheduled to be on the Flipper TV show. JW: Yes, they told me that a few months ago. It hasn't been shot yet. We're getting ready for this summer. They are trying to get me to do more than just a little thing there - to do a couple of them. BH: Someone mentioned you have been working on a TV swimming show. Is it a swimming-instructor show? JW: Yes, as I've mentioned, I'm connected with the Swimming Hall of Fame in Fort Lauderdale. We're trying to do a show on TV to teach kids how to swim. We can do it right. Photograph them on top of the water, and underneath the water, and do it in all languages. You know, you show kids how to do it. They're pretty good copycats. They can copy much faster than you can teach them. If you show them, they can do it. BH: You still working on it? JW: Oh, yeah, I've been working on it for some time. I'm gaining on it. It's going to be a good thing. BH: Do you ever watch your old movies on TV? BH: What kind of impression do you get of them? Do they bring back fond memories? JW: Oh, yeah, sometimes I look at it, and say "If I could just get away I could get that guy," and then one time this elephant pushed me over and I broke a rib, and things like that I think about. I kind of like them. I was glad I was able to do the things I did. You look at them over and over again and sometimes I say, "Gee, did I do that?" You know you get into a mood and you can do things you don't think you can do. A lot of people sometimes do. BH: Did you see the new  version of Tarzan the Ape Man? JW: Yes, I did see that. BH: It's a remake of your first movie. JW: Yes, almost the same, wasn't it? BH: Yes. There are a lot of scenes of you in it. BH: Yes, especially fighting that crocodile. JW: Yes, the crocodile. It's good to know you can outswim a crocodile. So, you're not afraid so much. But they're not tame, you've got to watch them. BH: How was Sol Lesser, compared with working at MGM? JW: Well, they're almost the same. 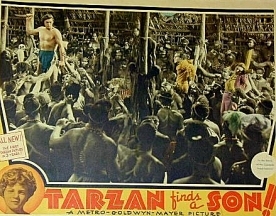 Sol Lesser had a lot of stock stuff from MGM masters. After we started with Sol, we used them. MGM did it so well. They had a lot of glass shots and a lot of trick photography and things like that, which is good for a picture because it really shows off. BH: When did they work on your yell, to get it canned? What did they do? JW: Oh, they did it in about a week. When I started on that picture my voice was very high, way back in '30. I used to be a good yodeler. I used to yodel a lot. I could do a yodel, a real good one. So I did a yodel, and another one a couple of octaves higher. And they pushed the two yodels together. So, when you have the two yodels together you can hear the "Yea-ya-ya-ya-ah.' It took me about six months to learn how to do it myself. BH: Did you do that in the first picture? JW: No, in the second one. BH: So, it was just your own yelling in the first one? JW: Yes, that's right. But I got to be pretty good at it. Now my voice is lower, and I have an awful time doing it, but they have it all canned now, it's all on a tape recorder, so it's not so bothersome. I used to lose my voice when I was doing it myself. I would do three or four yells and I would get hoarse. I'm glad I didn't have any dialogue. BH: When you did the first movie, was it a contract just for that movie? JW: Yes, just one movie. BH: Just one movie. They wanted to wait and see how that one did. JW: Yeah, I guess so. That's what they did. BH: Then was it one movie at a time from then on? JW: No, I signed a seven-year contract after that. BH: After the first movie? BH: How about with Sol Lesser? JW: Same thing. I signed a seven-year contract right off the bat. So I knew what I was going to do. So, I had a good deal with Sol. 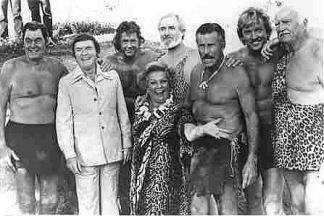 BH: The picture I've got in the mail for you to sign is one that was taken at the [Tarzan] reunion down in Mexico last September. 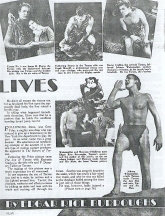 [On the Tarzan TV lot.] I'm trying to get all four of you to sign it. It's somewhere in the mail, trying to catch up with you. BH: Did you see any of the TV filming when you were down there? JW: Yes, I did see one little scene. It was indoors. It looked like just an ordinary shot to me. It didn't impress me at all. I think Ron [Ely] was doing some little dialogue in the night camp. It wasn't very much. We only stayed there for half an hour. Then we went out to the back lot and did some publicity stills together. BH: Here, I've got some other pictures for you to sign. BH: Let me take some pictures of you here. BH: I didn't know you were coming to this dinner until Monday. The paper said you were coming. BH: So I tried to get tickets, and the tickets were all gone by then. JW: OK. I've got to get better dressed before I go down. BH: OK. I guess we're finished here. Thanks very much for giving me this much time. I really do appreciate this meeting with you. I hope you enjoy the banquet. . . Goodbye, Johnny and good luck to you. Although he had some unfortunate health problems years later, he was in good health that day and looked great. I met him again four years later, but that will be another chapter in my life-long journey.